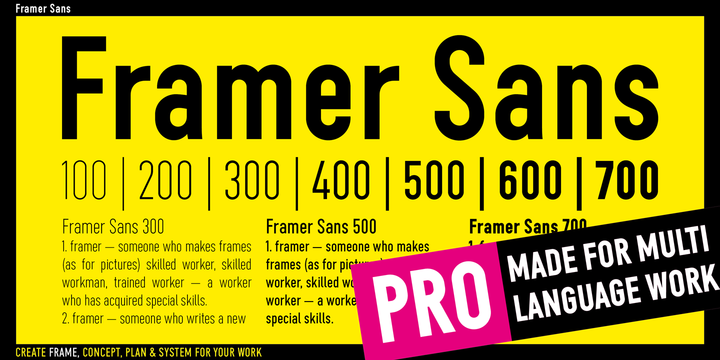 Framer Sans is a sans serif typeface published by June 23 in 2017, which is available in 253 country Codes, 7 weights numbered with numbers from 100 to 700, 4 shapes, over 2500 glyphs, over 100 symbols, (currencies, mathematical, arrows etc. ), 3 stylistic alternates (for latin letters with crossbars & Q) and multilanguage support. This clean, simple, geometric font is ideal for any kind of project. Have fun! Styles: 100, 200, 300, 400, 500, 600, 700. Price: starting from $35,00 for one font to $175,00 for all 7 fonts. A font description published on Wednesday, February 28th, 2018 in Fonts, June 23 by Alexandra that has 1,898 views.